I can be eccentric. This can be mistaken for lunacy. The question is: do I want to open it up for debate? Well, having thought (not too long but) quite hard about it, my conclusion: to hell with it; I’ll confess. 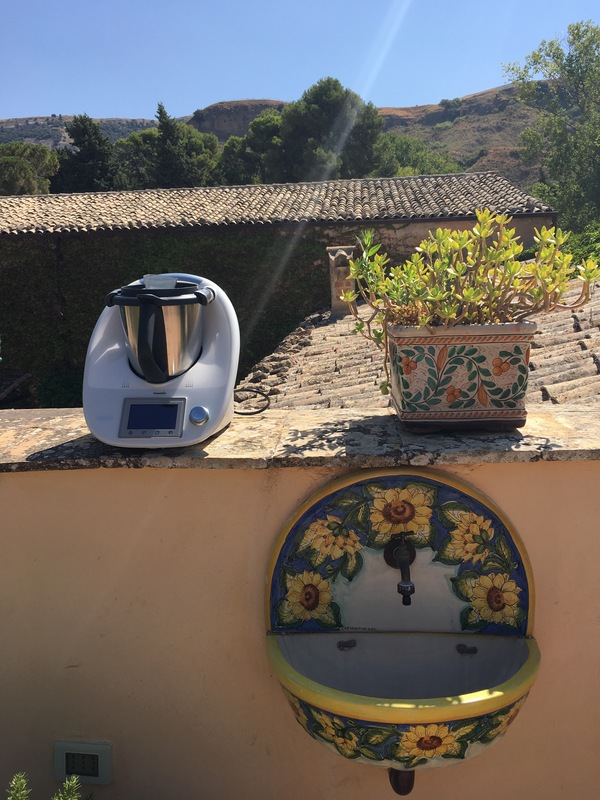 I TOOK MY THERMOMIX ON A TWO WEEK HOLIDAY TO SICILY! From the outset let me say this: I am not advocating flying with your Thermomix. There is always a risk when you transport any electronic gadget of it being knocked out of kilter. If you do not have to check in your Thermomix and can take it on board as hand luggage (pack the blade separately in your check-in luggage of course!) then the risk is minimal as it is in your hands. I know for a fact that the Thermomix without the Varoma packed in the custom made heavy duty bag fits into the overhead stowage bin of the 747 and Airbus as my friends have carried theirs to Kuala Lumpur and to Accra that way. On EasyJet the problem is this: the dimensions of the Thermomix are 33.5cm x 33.3 cm x 32.6 cm. The hand luggage allowance on EasyJet is 56cm x 45cm x 25cm. So the Thermomix is (without a bag) 7.6cm too big to take on board without the risk of it being confiscated and thrown in the the hold at your cost! So if travelling on a budget you will have to check it in. I flew Easyjet to Palermo. I didn’t have the original packaging. I wrapped my TM5 in reams and reams of bubblewrap and boxed it in a sturdy plastic toy crate and then clingfilmed the lot and slapped “FRAGILE” and “THIS WAY UP” stickers all over (in English and Italian!) and paid the £30 each way hold luggage fee. I knew that even if the box was tossed about despite the fragile handling stickers, it would be safe in the good quality bubblewrap but I still worried about it. I would not for a minute suggest you go through that stress but for me it was an invaluable addition to our holiday! And let me tell you, it was the best thing I ever did. Eight of us in a wonderful but very remote villa in the depths of Corleone dined in style on fresh Italian produce effortlessly assisted by the TM5. 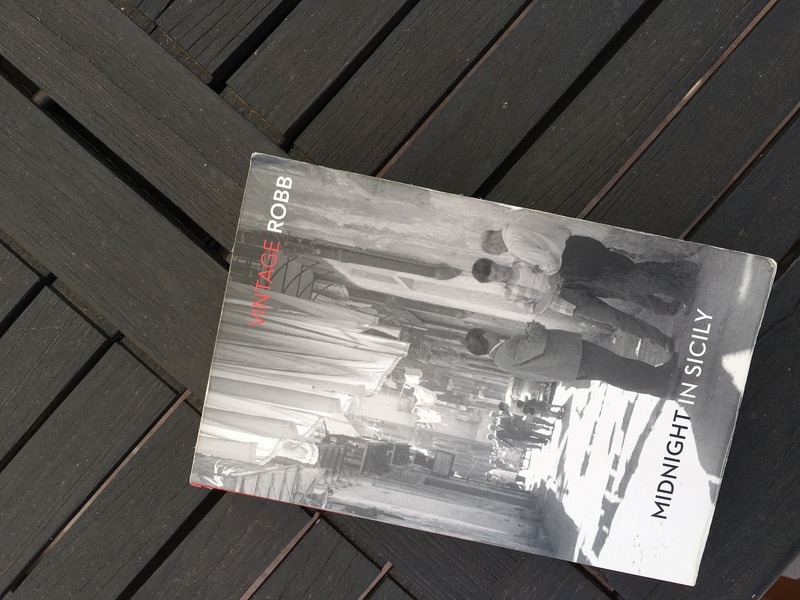 I read Midnight in Sicily by Peter Robb . The book came highly recommended as conjuring the feel of Sicily perfectly. And that it did. I was inspired to try all the recipes he wrote about. My Thermomix and the recipe platforms I have access to on Cookidoo (over 20,000 recipes worldwide which you can stream directly to your Thermomix with the Cook Key) including authentic Italian recipes made the experience perfect! Just so you know, people all over the world hire cooks to go with them on vacation. They are paid to go along to cook breakfast, lunch and dinner for large groups and families during their villa vacations, flights and accommodation included. It may sound extravagant but in fact it is cost effective as eating out every day and night in a large group does get very expensive. For example, at the wonderful Fattoria Corleonese found for us by Solosicily, a catering service was available. Traditional home cooking or gourmet options. Fine as a one off but €340 every day (or double that for lunch and dinner!) would have been beyond extravagant. With the Thermomix or Bimby as it is known as in Italy, with its precision temperature and time controls being an integral part we ate authentically and we ate well at a fraction of the cost! And there was little mess and washing up to contend with. I made delicious, authentic ragu watching Italian youtube for confirmation as to authenticity. Delicious tomato sauces made with sun ripe tomatoes and served with grilled white aubergine one day, pasta the next or on pizza too. The best gazpacho ever in a matter of minutes (not Italian I know but this delicious chilled Spanish soup works a treat in refreshing you in the heat of Sicily). My sister and I made friends with local market stall holders with the aid of Google Translate and a lot of laughing and gesturing, With their help I discovered cucuzza (the long green things in the top right of the market stall photo) and tenerumi (the leaves in the left hand side of the same photo) and came back to make them into a delicious vegetable dishes with olive oil and chillies and garlic and chopped tomatoes. And even my daughter got involved cooking for the whole family using fresh. Thermomix made pesto and chilli garlic olive oil, parmesan grated in 10 seconds and peas and pasta neatly cooked in the Thermomix whilst the sausages sizzled in the pan on the stove next to it. Excuse the photo with the faces cut out; my sister and child would disown me if I hadn’t! I am going to try my hand at cannoli after our hunt for the best; my all time favourite was from the commune of Marineo between Palermo and Corleone called Sciampagni. You can make your own fresh ricotta in the Thermomix because of the precision temperature control. Pastry is created in 20 seconds too! We ate spaghetti con le sarde in Palermo at a restaurant recommended by this blog and then I was able to recreate it back at the villa with the help of Giorgio Locatelli’s recipe in the Guardian and a Bimby recipe with the aid of Google Translate. Caponata was on every menu and Peter Robb gives you insight into its origins. It is so easily recreated in the Thermomix. I love this blog for adapting recipes. Our last dinner before I packed away the Thermomix was a “waste not want not” made with arborio, rosé wine and flaked sardines as an exquisite risotto. For those of you who don’t know, the Thermomix makes amazingly good risotto in 20 mins, start to finish, including grating your cheese and chopping your onions. And you don’t have to stand by stirring! If you already own a Thermomix bring the world of recipes to your finger tips and BUY YOUR COOK KEY whilst the special introductory offer is on! You won’t regret it! If you don’t own a Thermomix, now’s the time to buy one! You can eat international gourmet meals every day! I would be happy to organise a free cooking experience for you or get in touch with one of the many advisor local to you. In the meantime, as to my sanity, my move to travel with my Thermomix was, in my humble opinion, insane genius. We as a family saved hundreds of pounds taking the Thermomix and the food cooked in it was hands down some of the best on our holiday in Sicily!